I Don’t Really Have A Flea Problem – Do I? As we welcome the warm weather of spring that will soon lead to summer, we welcome the return of pests such as fleas and ticks. In this six-part series, we will discuss some of the major flea concerns and how to handle them. In this installment, we will discuss how to tell if you have a flea infestation. 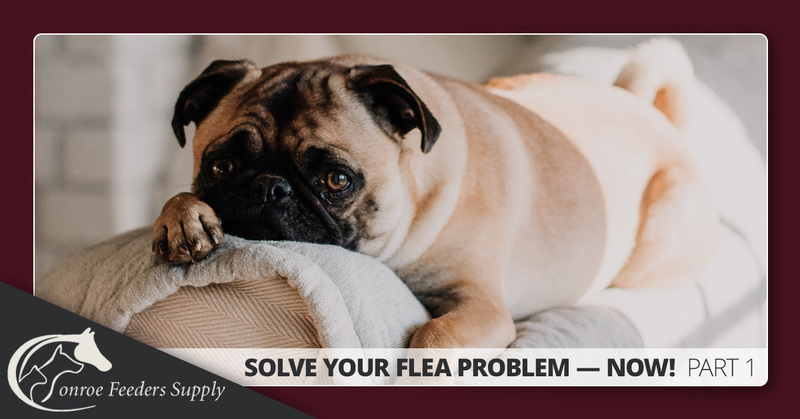 Flea infestations are frustrating, aggravating, and irritating, not only to your dog or cat but even to you and your family. Fleas can be found in every part of the US, and probably in every country. They are sneaky; hiding in dark, damp areas outside and once they get on your pet, they can come inside your home and leave their eggs in carpets, rugs, and on cloth covered furniture. This can result in a re-infestation every few days for months on end unless you do something to break the flea life cycle. The biggest sign of a flea infestation is an upswing in the frequency and intensity of any scratching you or your pets are doing. Keep an eye out for any frustrated or unusual scratchy behavior in your dog or cat. 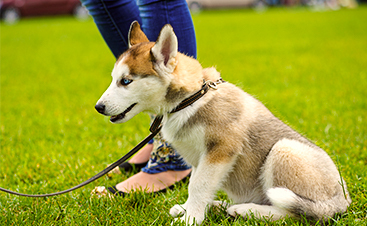 Fleas are big enough to be seen, so an easy place to look is on your pet. You may have to look closely because fleas can jump fast and high, quickly. The best place to look is in the armpit or the groin area. These places are warm and protected, making them great hiding places. Look for flea “dirt” (it’s actually flea feces) on your pet’s skin. This is typically found on the animal’s back, near the tail, head, or on the chest area. It can be difficult to differentiate between flea feces and any number of other dirt particles that might be caught in your pet’s fur. A good test is to drop these small black pellets in water. 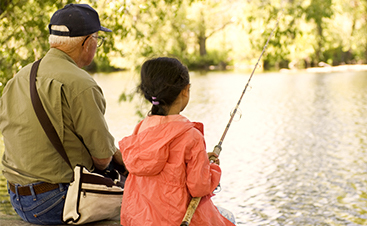 If the water or dropping begins to turn a sort of reddish brown — digested blood — then you’re looking at flea droppings. Sometimes the only symptom of a flea infestation is an unusual restlessness in your pet. This is often accompanied by a shaking of their head or a scratching of the ears. If you want proof that fleas have invaded your home, put on a pair of white socks and walk throughout your house. Fleas will be attracted to your motion, your body heat, and the white color of the socks. 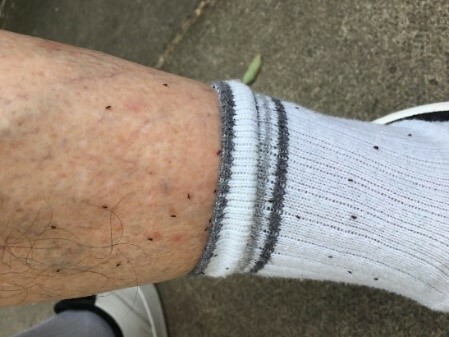 Fleas will jump onto the white socks making them easily visible. *Caution* Look closely at this picture, you will see that some of the fleas traveled from the sock to the skin area for their vampire-like” blood meal. Another easy way to confirm flea infestation is the “soapy water trap”. 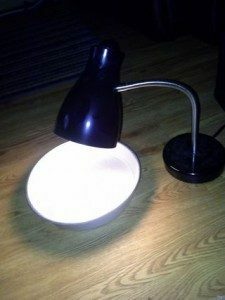 At night before all the lights are out, place a small bowl of soapy water on the floor and set a lamp beside it directing the light onto the water’s surface. During the night, fleas will jump toward the light, land in the soapy water, and drown. Whatever you do, don’t remain in denial. If you have a flea infestation, admit it, and let us help you arrive at a logical pest elimination program. 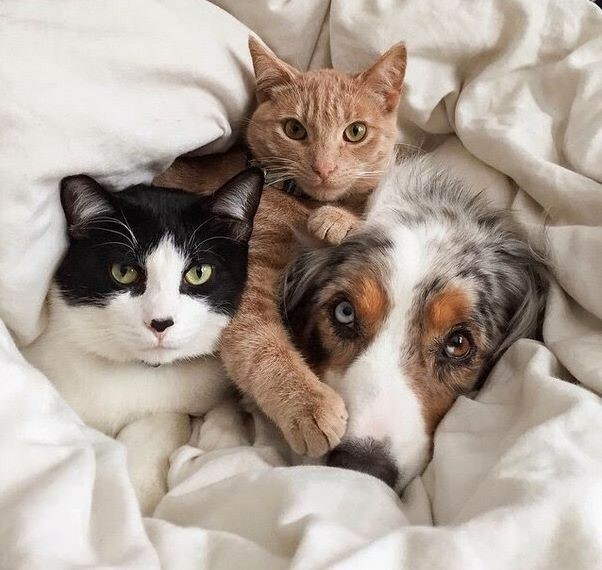 Ignored, this can become a serious problem for your pets and your family.